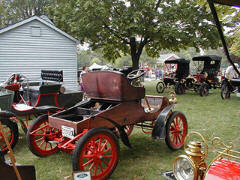 The September meeting was held at Jack Putnam's garage near Bluffton. Dave Benny led the meeting. The 2002 Ohio Jamboree was discussed with special emphasis on the location of the Jamboree. Hotel pricing and capacity seem to be the issues that are going to determine the location. Jim and Mel both gave their impressions of this year's tour. The biggest problem that most people had with the tour was the fact that it was downtown. Each day's tour started with the problem of getting out of town. We will try to avoid this problem by looking at hotels on the edges of towns. Jim also announced that the seed money for next year will be placed in a special account so that we keep club and tour money separate. 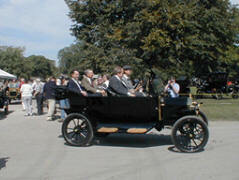 Jack informed the club of the dedication of the 1914 model T's to the Greenfield Village. 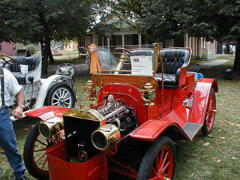 The dedication was to take place on the Thursday before the annual Old Car Festival. The Cook's had made tentative plans to try out a route for next year and invited anyone who was interested to come along. The meeting adjourned to refreshments and coil testing. 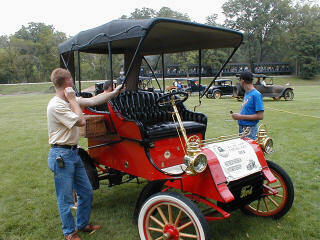 Three of the six 1914 Model T's that have been in the works for two years were dedicated to the Greenfield Village on the Thursday before the annual Old Car Festival. A party atmosphere was presented for the ocassion, with a babershop quartet singing melodies from the turn of the century. The Ford Motor Company called together all of those people who were involve with the project to share in the celebration. 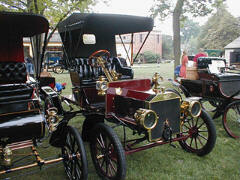 The "brass" from Ford and The Henry Ford Museum and Greenfield Village were assembled. And, the people who were to show their cars for the festival were also invited to come a day early to share in the excitement. Everyone was called to a specially set up tent, where the dignitaries were to make speeches and pat themselves on the back for a job well done. I don't remember names very well; but, I do know that the one that got the press snapping photographs was Edsel Ford. That's him in the front passenger seat of the 1914 in the picture to the left. His comments were brief, though very well said. 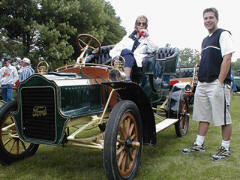 He acknowledged the fact that he was in the presence of probably the largest group of "Model T" historian in the country. He speculated, "Henry would be proud". the quadricycle, and finally his adventures in mass production of automobiles. The climax of the interactive tour will be the riding in and possibly "!driving!" one of the 1914's. (That's the point at which my heart skipped a few beats.) 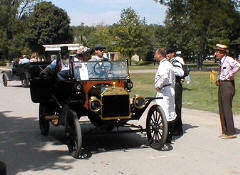 The presenter finished his spiel by inviting first the dignitaries and then everyone to take a ride in one of the 1914's. At that point the three T's were driven around the corner and up to the tent. The picture to the right shows Bud DeLong and his wife getting a ride in number 3. Every year the club talks about going to this car meet and we never really get around to doing it as a group. This year and last Sue and I couldn't get up to the show until Sunday. And, both years it has rained. In 2002 we pledge to try to get "Old Henry" into the show. There isn't another place that I've seen where you can be competely immersed in this era of classic cars. Take a moment to look at a few of the examples of classic cars. 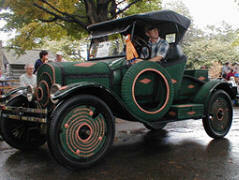 This is a 1926 Model T that is completely covered with wicker. This is what the Old Car Festival is all about. 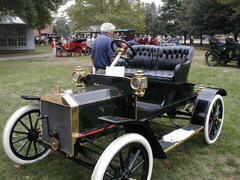 Here we see an antique car in front of the games field. The cars in the background are getting ready to compete in one of the many races that continue most of the afternoon. Notice the steam train in the background. In order to get ready for all of the 2002 participants of the Jamboree, Sue and I have started to scope out places for the folks to tour. These are some of the sites from Grand Rapids, Ohio. We have learned a few things from previous tours. 1. These guys bring their wives and they love to shop. 2. They like to drive their Model T's a lot! 3. They love to eat. 5. Restroom facilities are a must. If we can satisfy those basic needs, we'll have a great tour. 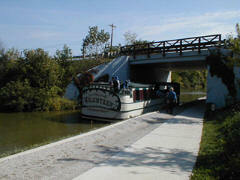 This canal boat is a replica of a passenger boat that was used on the Miami Canal between Lake Erie and the Ohio River. The Boat travels through Lock 44 that actually works. The crew operates it in route. 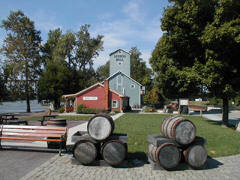 The red building is a giftshop and the grey building is a working mill. Behind the photographer are clean restrooms. 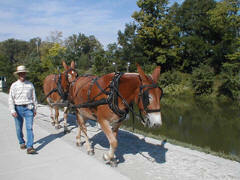 Two Mules provide the power at 4 mph.